Recent results of traffic congestion studies made me almost drop my ice cream in astonishment. The frozen treat only remained intact thanks to my cat like reflexes where desserts are concerned. I always knew that Brits have it tough with traffic queues but what I didn’t expect was that the UK would be in 4th place in terms of congestion. The top country on the list was, perhaps surprisingly, Belgium where drivers were forced to twiddle their thumbs and eat tasty waffles during an average of 55 hours last year. Next up came the Dutch, who at least could look out of their windows and admire the lovely windmills and tulips while they wondered when the traffic was ever going to get moving. In third place were the Italians, whose in car opera CDs must have got a good few spins last year. The list of the worst cities in Europe for busy streets includes London, Manchester and Liverpool. 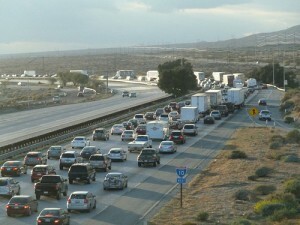 Overall, the average British driver wasted 32 hours of 2011 stuck in traffic. That’s 32 hours of your life which no one will ever give you back again. You could have watched over 20 games of football in that time or sat through enough episodes of Coronation Street to make you lose the will to live (in my case 1 is enough to be fair). In the case of London an astonishing 55 hours was the amount of time dedicated by drivers to sitting in traffic and trying to dislodge that troublesome lump of ear wax or looking in the rear view mirror and worrying about their hairline. In the case of Liverpool it was 39 hours and in Manchester 45. What’s that? You want some good news? Well, the only scrap of good news I could salvage from this story is that the amount of hours Brits lost in traffic jams fell 4 hours from 2010 figures. Is that enough to keep you happy? This entry was posted in News and Views and tagged Aston, Belgium, car, Coronation Street, Europe, London, LS, LV, UK by Robert Bell. Bookmark the permalink.